the dish 12 in. (30.5 cm.) diam. The arms are those of Portugal quartering León for the family of de Sousa of Prado, Portugal, descendants of an illegitimate son of King Alphonso III of Portugal (d. 1279). The arms are surmounted by a what appears to be Marquess' coronet. However, there was little codification of coronets in Portugal prior to the seventeenth century. The family was elevated from Counts of Prado to Marquesses of Minas in the eighteenth century. Assuming that the arms and feet are indeed eighteenth-century additions to a dish that had been in the de Sousa family, it is likely that the dish was made for Don Pedro de Sousa, 1st Count of Prado who died on 23 March 1555. The son of Rui de Sousa, Lord of Sagres and Beringel, ambassador to the Courts of St. James and of Castille, he was a leading Royal councillor, soldier and poet. Alternatively the arms could be those of the Count of Prado's first cousin, Martin Afonso de Sousa. Equally distinguished, he was Governor of India from 1542 until 1545 and a soldier, navigator and one of the first colonisers of Brazil. He died in Lisbon in 1564. 1913 Bath House Inventory, p. 138, no. 680, in the safe. 1914 Wernher Inventory, p. 94, no. 460. The border decoration is extremely similar to that on a magnificent salver with matching ewer engraved with the arms of the de Sousas of Prado surmounted by a Count's coronet. This belonged to Fernando II (b. 1816, King Consort of Portugual, 1837, d. 1885), and is now in the Royal Collection in the Ajuda Palace, Lisbon (L. d'Orey, 'Silverware of Portuguese Kings', in Royal Treasures, Lisbon, 1992, nos. 338-339). In addition a salver on stand from the collection of Fernando II with the arms of de Sousa beneath a Marquis' coronet is in the Ajuda Palace Collection (ibid., no. 334). The salver on stand in the Ajuda Palace is engraved on the reverse, no. 8, an inventory number used on silver in Fernando II's collection. 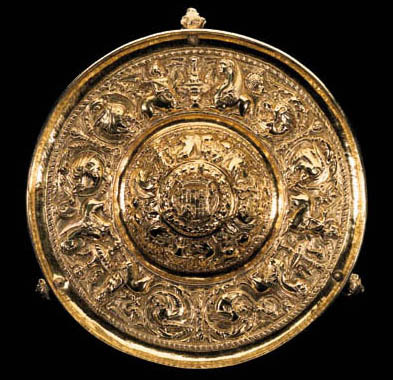 The present salver is also engraved with an inventory number and, although the numeral has been deliberately erased, it is still at least partly visible, and is probably a 9. However, it should be pointed out that there is another eighteenth-century salver on foot in the Ajuda Palace with the number 9 inventory number (ibid. no. 336).